One of our favorite Zoos in the entire world happens to be the Cape May County Zoo in New Jersey. If you have never visited this beautiful, laid-back zoo, you really should! The zoo has free admission and they only ask that you give a small donation...we usually drop a twenty dollar bill in the donation bucket when entering the zoo. Once inside the zoo, it is laid out very nicely and if you take your time, you can go through the entire zoo in less than 3 hours...tops! You will see various species of birds, reptiles, amphibians, primates (monkeys), zebra, lions, tigers and bears...oh my! They also have a small section in the zoo where children can feed and see small farm animals like pot belly pigs, goats, ducks and chickens! Our little grand daughter loves that area of the zoo for sure! After spending time in the zoo, you can visit their small cafe that sits right outside the entrance/exit of the zoo for some lunch, snacks and/or drinks. Just be warned...their food and drinks are not cheap and in our opinion, not that great tasting! We take our own picnic lunch with us and eat at one of the many picnic tables that sit outside of the actual zoo gates. 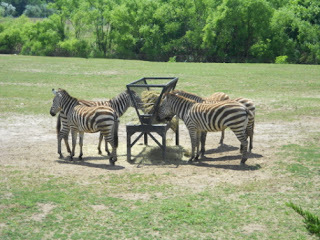 Enjoy our PHOTO OF THE WEEK for this week which features the beautiful Zebra at the Cape May County Zoo! If you ever get the chance, this is one zoo you need to visit and add to your bucket list.